Entity Developer for Entity Framework offer a numerous advantages for Entity Framework v1 - v6 over the standard Visual Studio EDM Designer. The main advantages include advanced database-first and model-first approach support, powerful template-based code generation, and ability to test your model with LINQ and Entity SQL queries at design-time. For the detailed feature comparison of Entity Developer and EDM designer see the Entity Developer vs Entity Data Model Designer page. 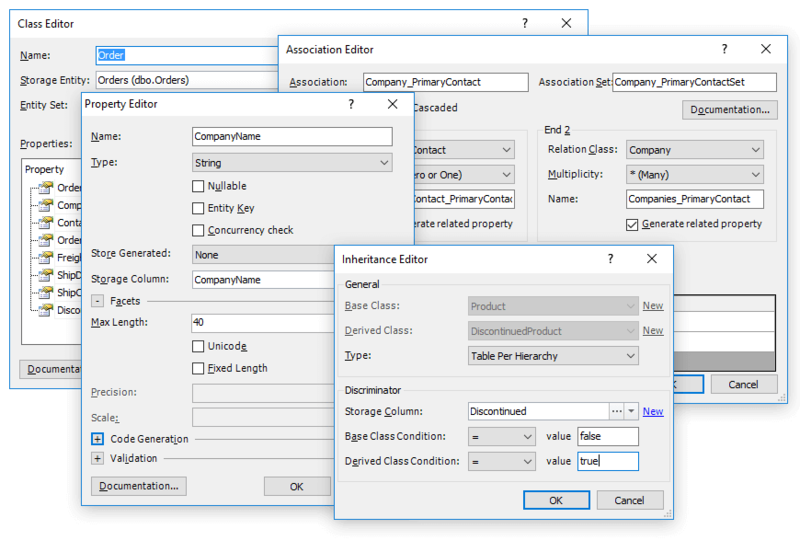 With our Entity Framework designer you can use either Model-First or Database-First design approach, or you may mix them in any way you like. Easy-to-use Update From Database and Update To Database wizards allow you to synchronize your model and database in any directions at any moment. Update From Database Wizard tries to preserve manual changes to the model where possible. 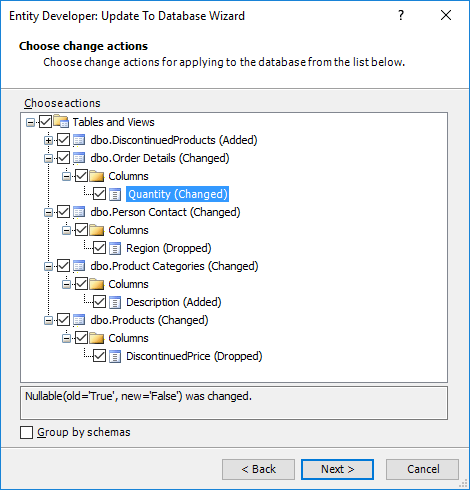 The Update From Database and Update To Database wizards detect all the database changes that can affect the model and vice versa, e.g. created and deleted tables and views, their columns and foreign keys, column datatype changes, etc. All changes are displayed in an easy-to-understand form, and you can select only a part of the changes to apply. When updating database schema, Entity Developer considers database server specificity. It does not try to perform unsupported operations. Entity Framework v1 - v6 models have explicit storage and mapping parts. When designing model in EDM designer, it generates the mapping and storage part based on the conceptual part of the model. And if you make some changes to mapping and storage parts, rename storage tables, etc., these manual changes are lost every time you re-generate a database. To address this problem, Entity Developer offers mapping synchronization. With mapping synchronization, changes to the conceptual model are automatically applied to its mapping and storage part. For example, when you add a class to the conceptual part, a corresponding table is created in the storage part, and the class is automatically mapped to this table. If you make any manual changes to the mapping and storage parts, they are preserved when editing the conceptual part. And when you generate or update the database from your model, all manual changes, made to the storage part, are preserved too. When using database-first approach, Entity Developer for Entity Framework provides a number of options for creating a model. You may tweak naming rules for the generated names of the classes and their members. Entity Developer allows you to configure case and pluralization, removing and adding of prefixes and suffixes, etc. After this you may set the default parameters for the generated classes: default assembly and namespace, default schema, cascade style, strategy for accessing a property value, etc. 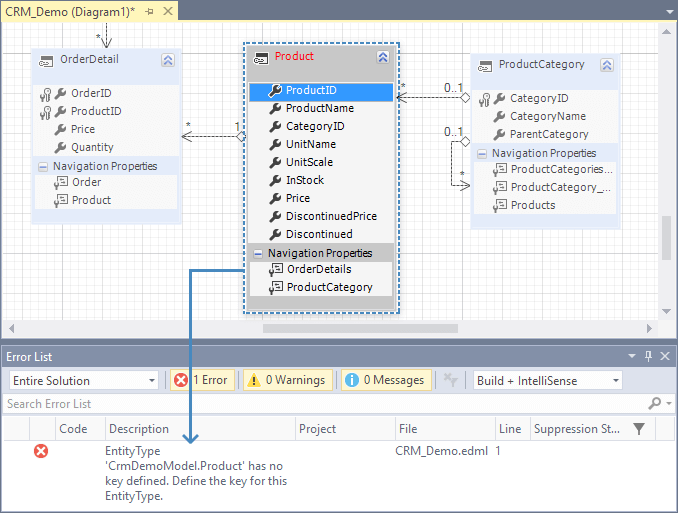 Designing Entity Framework models with Entity Developer is easy and intuitive. Only the most frequently used mapping parameters are accessed through the editor dialog boxes, making our editors simple and easy to understand. If you need more extended mapping tuning, you can find all the available parameters of a model object in the Properties window. All the mapping is defined visually, you don't need to manually edit XML mapping files. Entity Developer for Entity Framework supports almost all features of Entity Framework mapping. It supports complex types, different kinds of associations, all kinds of inheritance mapping strategies. To accelerate model design process, our Entity Framework designer provides wide support for drag-and-drop functionality. After you have established a database connection, you may drag database tables and views from the Database Explorer window to your model diagram to create classes for these tables with already defined mapping. To quickly create a TPC or TPH hierarchy in a model, reverse-engineered from a database, you may just drag several properties from the class to create a base or derived class from them. In the same way you may quickly create an Entity Framework complex type from a set of class properties. Our Entity Framework designer always validates your model while you are editing it. All errors and warnings automatically appear in the Error List window. Error list displays error or warning message and its location. You can easily navigate to the object that caused an error by double-clicking it in the Error List window. Thus you may find and fix model errors quickly and conveniently. Entity Developer has a powerful template-based code generation system that offers a number of ways to configure generation process according to your particular needs. Entity Developer includes a number of templates for generating code for different cases. It can generate POCO or persitance aware classes in C# or Visual Basic and supports third-party ADO.NET providers for SQL Server, Oracle, MySQL, PostgreSQL, DB2, Firebird, and SQLite. 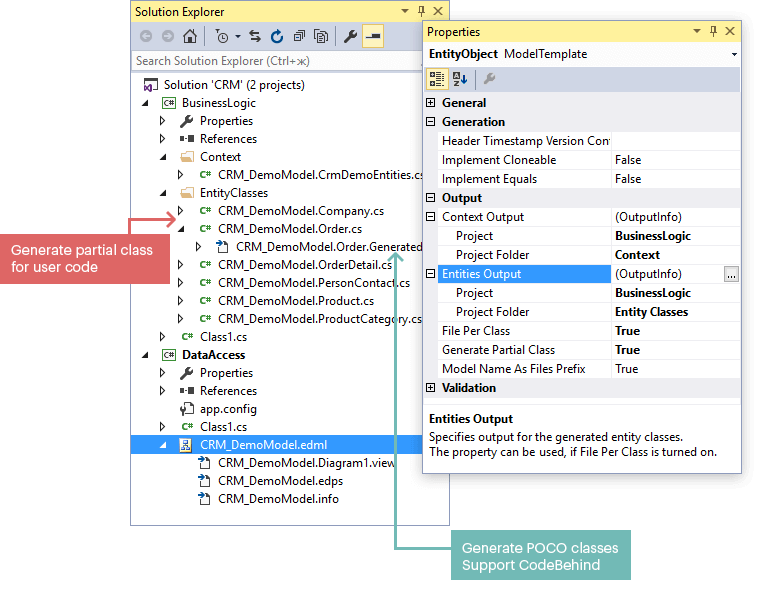 Entities Output property allows you to specify output folder or output Visual Studio project for generated entities. Context Output property allows you to specify output folder or output Visual Studio project for the generated context class. File Per Class option allows you to choose whether to generate classes either into a single code file or into a separate code file for each persistent class. This setting is used by default. Generate Partial Classes property enables generation of partial classes with a separate file for generated code and a file for user code per class (Code-behind). Entity Developer seamlessly integrates to Visual Studio. The model is created and edited just like any other Visual Studio project item. Code for a model is generated each time you save the model and is automatically placed to the project, containing the model, by default. You may redirect code output to other Visual Studio project if necessary. Our Entity Framework designer allows viewing and editing data of tables, views, and model entities, create and execute LINQ and Entity SQL queries against the model, eliminating the need for additional applications and reducing time for accessing these operations. With Entity Developer you may perform viewing and quick editing of the database data from the tables in the Database Explorer. This data is editable, allowing you to quickly insert some data into the database to perform some testing. Our Entity Framework designer allows you to execute LINQ or Entity SQL queries directly against the model without the need to write a sample application. You can use our built-in query editor to design queries, which can be saved for future use, and view the returned data and generated SQL.